I was an unhappy, out-of-work actor in 1974, working on a building site where they all took the mickey and called me Laurence Olivier. In desperation, I wrote to the BBC just as they were looking to replace Jon Pertwee, who was stepping down as Doctor Who. There were plenty of others in consideration, but when the team behind the programme saw The Golden Voyage of Sinbad, the Ray Harryhausen film in which I played the magician Koura, that was it. I didn't consciously try to be different from Jon because I didn't know anything about the series. I was younger, of course – but, having been brought up a Catholic, the idea of disappearing and reappearing, of miraculous events, strange voices and all the other mad things about Doctor Who seemed totally natural to me. Luckily, I got on straight away with my companion Elisabeth Sladen, who played Sarah Jane. She was very influential. The directors didn't always like the things I suggested, like carrying jelly babies, but she thought I was very funny. Because she laughed at what I was doing, the directors noticed and relaxed. Costume designer Jim Acheson devised my "bohemian look", modelling it on that of a fin-de-siècle student in Paris. The multicoloured scarf came about after Jim bought a wagonload of wool. 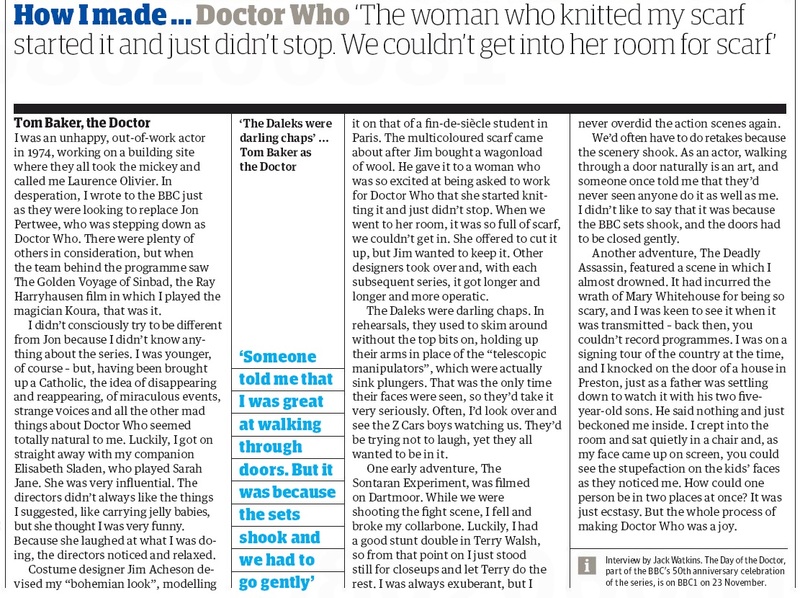 He gave it to a woman who was so excited at being asked to work for Doctor Who that she started knitting it and just didn't stop. When we went to her room, it was so full of scarf, we couldn't get in. She offered to cut it up, but Jim wanted to keep it. Other designers took over and, with each subsequent series, it got longer and longer and more operatic. The Daleks were darling chaps. In rehearsals, they used to skim around without the top bits on, holding up their arms in place of the "telescopic manipulators", which were actually sink plungers. That was the only time their faces were seen, so they'd take it very seriously. Often, I'd look over and see the Z Cars boys watching us. They'd be trying not to laugh, yet they all wanted to be in it. One early adventure, The Sontaran Experiment, was filmed on Dartmoor. While we were shooting the fight scene, I fell and broke my collarbone. Luckily, I had a good stunt double in Terry Walsh, so from that point on I just stood still for closeups and let Terry do the rest. I was always exuberant, but I never overdid the action scenes again. We'd often have to do retakes because the scenery shook. As an actor, walking through a door naturally is an art, and someone once told me that they'd never seen anyone do it as well as me. I didn't like to say that it was because the BBC sets shook, and the doors had to be closed gently. Another adventure, The Deadly Assassin, featured a scene in which I almost drowned. It had incurred the wrath of Mary Whitehouse for being so scary, and I was keen to see it when it was transmitted – back then, you couldn't record programmes. I was on a signing tour of the country at the time, and I knocked on the door of a house in Preston, just as a father was settling down to watch it with his two five-year-old sons. He said nothing and just beckoned me inside. I crept into the room and sat quietly in a chair and, as my face came up on screen, you could see the stupefaction on the kids' faces as they noticed me. How could one person be in two places at once? It was just ecstasy. But the whole process of making Doctor Who was a joy. APA 6th ed. : Watkins, Jack (2013-11-05). How I made ... Doctor Who. The Guardian . MLA 7th ed. : Watkins, Jack. "How I made ... Doctor Who." The Guardian [add city] 2013-11-05. Print. Turabian: Watkins, Jack. "How I made ... Doctor Who." The Guardian, 2013-11-05, section, edition. This page was last modified on 11 February 2014, at 23:55.